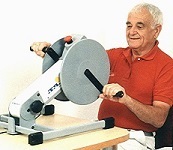 Do you need motor Assisted exercise? Do you want to exercise ARMS, or LEGS? if so, APT Base units are smaller than APT on HiLo stand. If so, you can start with an APT-1 Base model, get only the accessories you need now. Later you can add other accessories, as you situation and budget permit. Are you going to be switching often between arms and legs? If yes, then consider the APT on the HiLo Stand – it is easier to switch between arms and legs. Do have very stiff muscles or strong spasms? If so, then consider the APT-5 – it offers some extra useful features. How to get Started with an APT? In some cases you may Rent the APT-1 Base system, please call / contact us to discuss.